However, since then I haven’t been unable to shake this stunning lounge chair from my mind! Taking my interest further, I could not help but want to blog about it. Figured you guys wouldn’t mind! 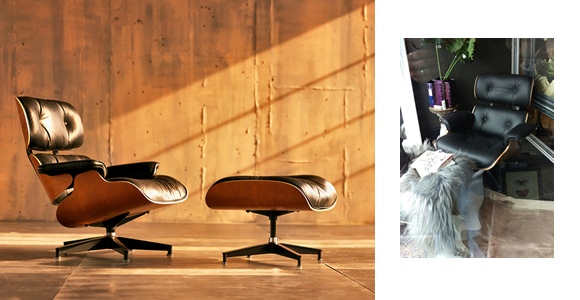 Designed by the furniture legends Charles and Ray Eames, the original lounge chair and ottoman was designed and manufactured for their good friend Billy Wilder in 1956. Their main inspiration stemmed from the notorious filmmaker using a makeshift chair to nap on in between takes. The chair is composed of 3 curved plywood shells: the headrest, the backrest and the seat. The base is aluminium. The leather seat was designed around the image of a baseball mitt, using distressed leather to create a traditional finish, complementing a contemporary design. The finished product has been an influential triumph in the furniture design sector since. The use of the “baseball mitt look” shows how they might have been inspired by a very popular national sport, and were proud of the heritage surrounding this. The final product was debuted on “Arlene Francis’ Home Show” in 1956, televised on NBC. 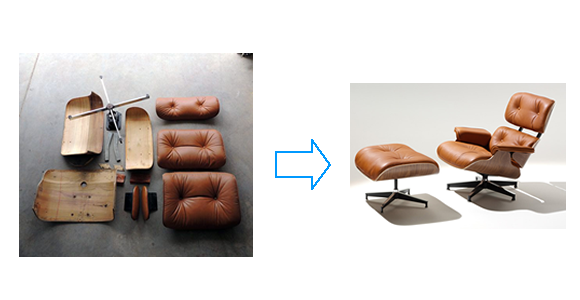 Furniture design and style was advancing towards change as fast as technology was! It was not only the style and simple curves that transformed the way people viewed furniture. During a period of very sparce and minimal furniture, Eames was able to use the technology of “moulding plywood”, as used during the Second World War, to create the desired shape and effect. By applying heat and pressure, 5 thin layers of plywood moulded the shells and Brazilian rosewood veneer (discontinued in the early 1990s) was applied to this as the finish. The strength that is created by the heat and pressing of plywood also made the product lighter. At present, Vitra, continue to manufacture the chairs with the same technique. These days 7 layers of plywood is used and other finishing veneers such as cherry, walnut and Palisander rosewood are applied since the discontinuation of the Brazilian rosewood. The Palisander rosewood has a very similar grain to the original finish, not straying the new designs too far away from the original workmanship and design. Other leather colours, such as black and ivory are also now an option which offers a great choice of variety and keeps the timeless fabrication alive. 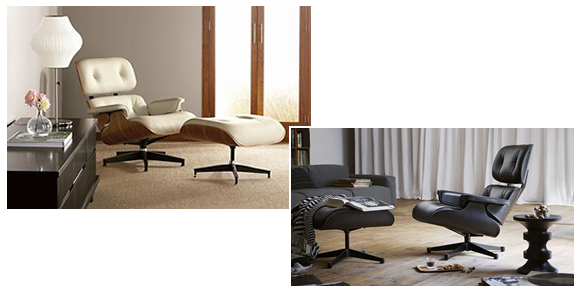 The style and manufacturing process summed up contemporary change for the furniture industry. The look and design of the chair and ottoman has been an inspiration to the furniture design industry and one that is not likely to fade. It really is no wonder that the “American Icon” furniture set is in the permanent collection of New York’s Museum of Art. I want one!